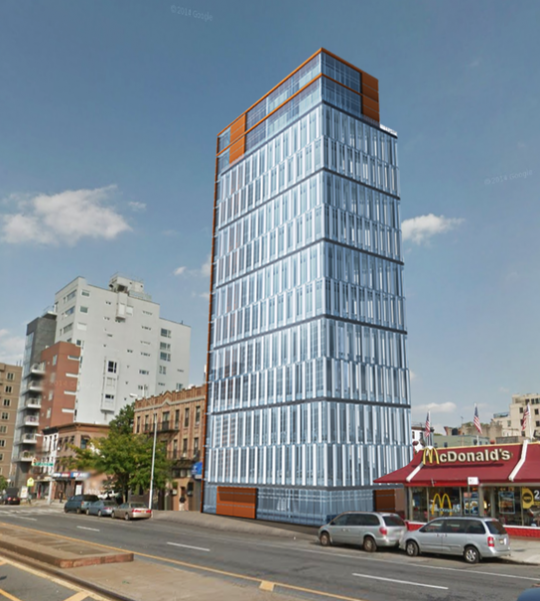 271 Fourth Avenue, rendering from New Empire Building Corp.
Last January, the Brooklyn Eagle reported that an LLC led by Juneng Zhao bought the lots at 269-271 Fourth Avenue for $4.4 million, or a bit over $100 per buildable square foot – a steal compared to current prices. They are located on the stretch of Fourth Avenue that marks the transition zone between the Brooklyn neighborhoods of Park Slope and Gowanus, and the corridor has seen a construction boom in recent years following a rezoning in 2003 that allowed larger mid-rise residential buildings. And now YIMBY has the first look at Zhao’s project, which will stand 12 stories and 120 feet tall, and have just over 50,000 square feet of floor space. Aesthetically, the simple glass design will be a notch above much of the neighborhood’s new infill from the last decade, with a clean glass façade. Its verticality – a welcome change for Fourth Avenue, where parcels tend to be larger and buildings therefore bulkier and more horizontal – will be broken up by two-story, horizontal segments, with an orange-colored material, perhaps Corten steel, framing the duplex penthouse on top and the ground-floor lobby. Just next door, at 275 Fourth Avenue, ODA is designing a 75-unit rental building for Adam America that will be much more ornate, with a wedge gouged from a corner of the building resulting in ample outdoor space for many of its units. Tony Onyeagoro of Building Consulting Engineering is listed as the architect of record, and the project also includes 762 square feet of commercial space, and 2,627 square feet set aside for a community facility use. It has not been announced whether the development’s 26 units will be rentals or condos, but given their average size of approximately 1,500 square feet and the lack of PTACs – not to mention – condos would seem likelier. The new building permit was filed in late November, though the project does not yet have a formal completion date. Permits Filed for 410 10th Street, Park Slope, Brooklyn.